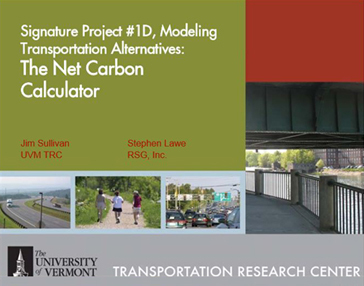 Vermont Integrated Land Use and Transportation Carbon Estimator | Resource Systems Group, Inc.
With funding from FHWA, RSG worked with the UVM’s Transportation Research Center to design and construct a customized ESRI ArcGIS software extension that calculated net greenhouse gas emissions from changes in regional travel demand and land use changes (deforestation from development). Inputs included transportation networks, employment and housing allocation, and rasterized land cover data. The software was constructed to be a simple ArcGIS tool installation running on a planner’s desktop machine, allowing for rapid scenario greenhouse gas computations and comparisons to be made in a widely used tool. A 2010 TRB presentation summarized the methodologies.